Today I'm extremely excited to announce another fantastic Christmas Decor Giveaway! Ten36Designs has generously donated a lovely handmade Fused Glass Christmas Tree Tray, which normally retails for $30.00. The festive red dish is 6x6 and has a hunter green tree in the center with gold and silver sparkles. I love the simplicity of the dish. My other favorite item from Ten36Designs is the Snowflake Fused Glass Tray. Of course I love good deals, so here are a couple tips for saving big bucks on Fused Glass. Between 1:00 p.m. - 4:00 p.m. on November 28th, 2014 (Black Friday) Ten36Designs is offering 40% off everything in their Etsy store! Use the coupon code BLKFRDY14! Now back to the details of the giveaway! One person will win a beautiful Fused Glass Christmas Tree Tray from Ten36Designs. You can enter the giveaway below. Don't forget to read the terms and conditions. Best wishes to all who enter! 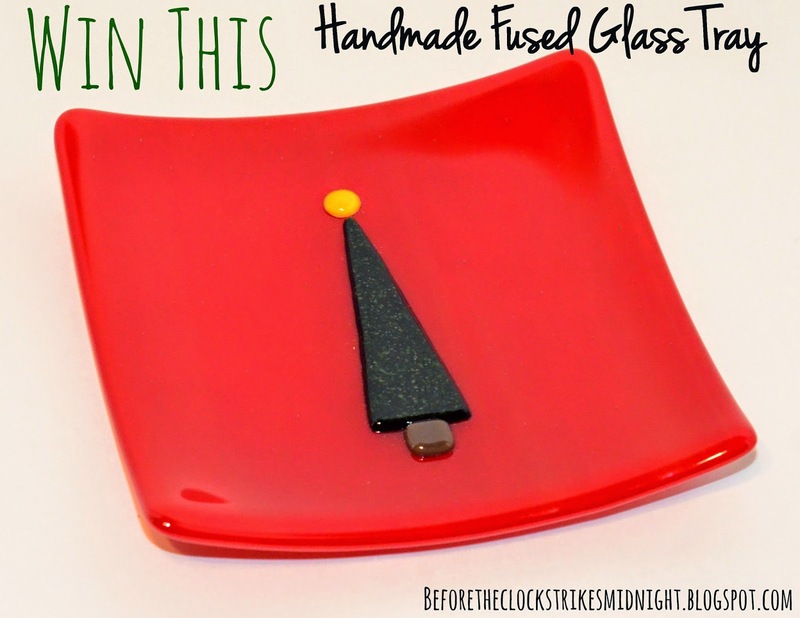 One winner will receive (1) Fused Glass Christmas Tree Tray from the Etsy Shop Ten36Designs. Anyone wanting to enter must live in the United States and be at least 18 years old. Refer to the giveaway for details on the opening and closing dates. The winner is chosen randomly and announced two days after the giveaway closes. The winner has 48 hours to respond or their prize will be given to another person. I was not compensated to write this review. All thoughts and opinions are my own. Make sure to check out the adorable snowman decor giveaway! The product I like the most from RansburyDecor is the "Welcome to the Circus Sign - Digital Chalkboard Sign - Printable Chalkboard - Carnival - Big Top Tent". I think is describes my family the best! I most like the Handmade Dichroic and Black Glass Earrings and Pendant Set.